Thanks to a higher command driving position and impressive ground clearance, your KIA SUV is a joy to drive just about anywhere. However, getting in and out during a busy day can be exhausting. Fortunately, we have the ideal solution in our parts department at Hanson KIA with a set of genuine OEM side steps. These factory KIA accessories are engineered to be an exact fit while lasting with a level of quality that earns the industry's best warranty. Why Get a Set of Genuine KIA Side Steps for Your SUV? The aftermarket is full of automotive accessories like side steps, but only genuine KIA side steps are engineered specifically for your KIA. This means that they'll look just right and be a perfect fit. What's more, if something were to happen that causes the side steps to fall off and damage your KIA, everything will still be covered by the warranty when properly installed. Ask us about having the certified technicians in our service department properly install these genuine KIA accessories. Our online KIA parts store is available to browse any time, and it's easy to place your order when you find what you need. 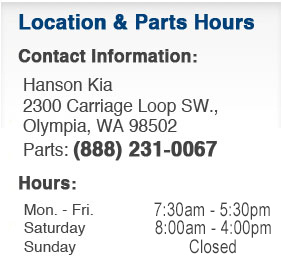 If you have any questions, give one of the experts a call in our KIA parts department. If you prefer, simply stop in and see us in person at 2300 Carriage Loop SW, Olympia, WA 98502. KIA is able to back their vehicles with the industry's best warranties, so you know that every part, component, and accessory is engineered to the highest standards. This means that when the time comes to service, maintain, or repair your KIA, it only makes sense to trust the same high quality that came with your ride from the factory. Fortunately, that's exactly what you'll find in our well-stocked KIA parts department. Here, you'll find everything you need whether it's for basic maintenance like your next oil change, more involved service like a timing belt change, or upgrades with genuine KIA accessories. Be sure to check out our updated special offers on common KIA parts, and you'll find more details on what to expect on information pages like this one. We look forward to meeting you soon at Hanson KIA serving Centralia and Chehalis, WA.